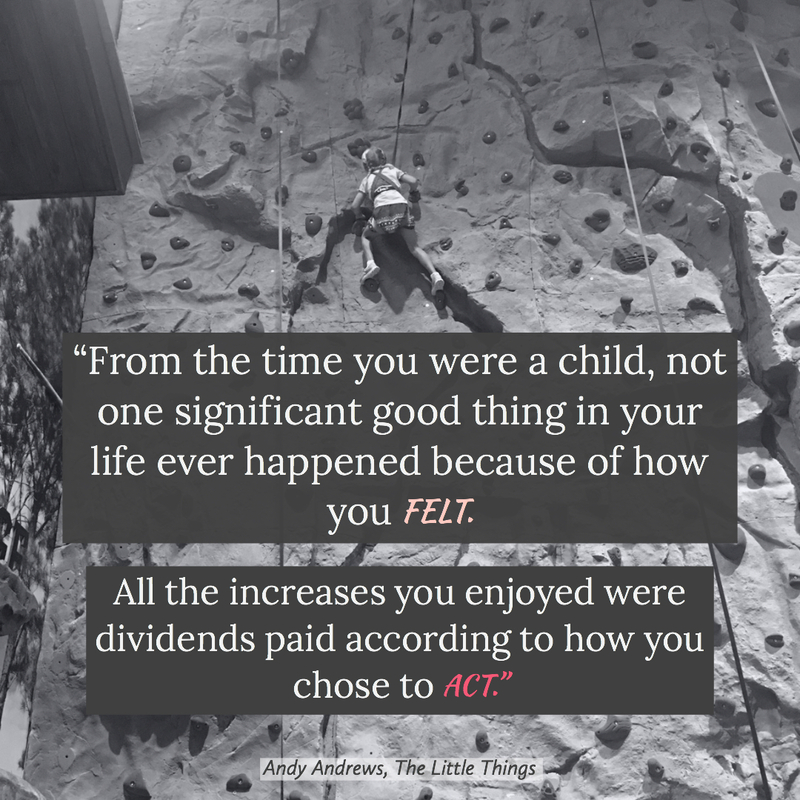 Below are statements I read recently from Andy Andrew’s book, The Little Things. They came after a series of questions and statements meant to help us understand that we make our own choices and those choices are based on what we believe. And, what we believe determines how we act. “Other than our family or closet friends, and despite laws and regulations designed to protect our feelings, no one really cares how we feel”. “They only care how we act”. These statements made me stop. I literally had to put the book down and stare at the wall. It was one of those moments where you feel so uncomfortable and embarrassed, that you feel like you might burst into that emotional, nervous laugh or cry. Has that ever happened to you? For years now, I have informally studied performance, potential, psychology, personal development, leadership, and any other topic that I can find that could potentially help me get better. Why? Well, I certainly don’t do it because I have it all figured out. That’s for sure. I have college degrees, years of experience, ambition, and most would say that I function just fine. But, that hasn’t mattered to me. I had long felt that my mindset, in other words, the way that I was thinking about things was creating roadblocks in my life. According to Andy Andrews, “a person cannot achieve beyond what he really believes to be the truth about himself.” To that, I’d say, that if I want to get better, I need to make sure that I have all the information and tools that I can find. And, when it comes to better thinking, I need all the help I can get. I consider myself a highly “feeling” person. Some call it “highly sensitive”. But, I realized that the more I learned about myself, the more I considered how I feel about things, the more impact I felt that I wanted to make, the more I thought about the good intentions I have, and the more revelations I felt like I was having- it was only leading me to knowing about it. In other words, I knew I felt and noticed things – but okay, great. Now what? I believe the simple answer can be found in statement #1: No one cares how you feel, they care how you act. To be clear, all of the things that I think and feel, all of the well-meaning intentions in my mind, all of the impacts I think about making – none of that matters until I decide to act on it. He proves this with many examples, but you can prove it to yourself by trying to think of one example of when your feelings alone mattered. I have tried and I just can’t seem to think of one. The simple truth that is revealed in this lesson is that feelings mean nothing until you act on them. It’s what you do that matters. Oh, it gets even better…. If you glance back at statement #2, the pearl there is that what you decide to do has to also include how it will affect everyone else. This seems obvious – but is it? Do you really get this? When I read this, for some reason, it just hit me. I hadn’t realized just how selfish my feelings and actions have been and how this is true for most everyone. I hadn’t realized that I was doing the “discovering and learning” part but I was missing the “change things for the rest of us” piece. If you can admit this about yourself and understand it about most all other people, what might you do differently? Andy says that when faced with something new, most everyone asks themselves “what’s in it for me?” and “is there proof?”. That person has something we admire and want for ourselves. 1) What do you post/write about? When you want to brag about an accomplishment, show off something, or want attention. Are you seeing the pattern? I’m thinking the “what’s in it for me” premise might be spot on. This challenge was not meant to discourage you. It was meant to help you understand humans. We are all this way. But, we can all use this understanding to get better. Accepting these foundational truths can truly shift our mindsets. For me, I’ve felt more than I’ve done and I’ve thought more about my wants than what’s in it for others. If I can flip that, not only will I be a better person, but just maybe I’ll finally have that impact I had only been thinking about. And, by sharing the lessons I find on my own personal search – maybe I can address both of Andy’s original statements because even something as simple as sharing is both an action and a way to help change understanding for other people.